The Yuel Family Physical Activity Research Centre (PARC) is a community-based research facility that is led by ICORD researchers and a PARC Advisory Committee made up of members from ICORD, Spinal Cord Injury BC, GF Strong Rehabilitation Centre, and the UBC School of Kinesiology Outreach Program. The facility is committed to providing opportunities for the local spinal cord injury (SCI) community to participate in research on exercise and physical activity. We envision that the PARC will nurture an active exchange of ideas between the community of individuals living with SCI and ICORD researchers. 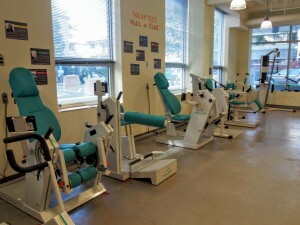 The PARC offers a wide variety of exercise equipment. Most of the exercise equipment at PARC can be used directly from your wheelchair or are easily transferable from your wheelchair. PARC located on the ground floor of the Blusson Spinal Cord Centre. 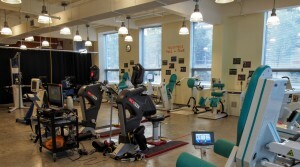 The facility is overseen by ICORD researchers and clinicians and supervised by student staff and volunteers who assist people with varying abilities to work towards leading active and healthy lives. Our goal is to advance research to understand the best strategies for providing opportunities for people with complete or partial paralysis due to spinal cord dysfunction to participate in exercise and physical activity. The aim of this study is to examine physical activity and health outcomes in people with spinal cord injury (SCI) resulting in complete or partial paralysis. We plan to elucidate the best approaches to providing opportunities for people with SCI in and around Vancouver to participate in exercise and physical activity. We will also investigate whether increasing physical activity and exercise leads to benefits in different aspects of your physical function, fitness and quality of life. If you are interested in joining PARC, please check out the Getting Started in PARC webpage for more information. You can also contact us at parc@icord.org or call us at 604-675-8814 for more information or to sign up to use the facility. The facility is located on the ground level of Blusson Spinal Cord Centre, 818 West 10th Avenue. If travelling by transit, the facility is near Willow Street, and is near bus stops for buses 009, 017, and 099. The Broadway-City Hall Canada Line Skytrain Station is just 700 meters away from the facility. ICORD has two lots for research study participant parking. These spots are for individuals who are volunteering their time for active research with ICORD at BSCC. If you participate in a study at the PARC, you are eligible to use one of these parking spots. Be sure to request a parking pass from a PARC staff member. The passes are date-stamped, must be displayed in addition to a valid SPARC pass, and must be returned to the PARC after completing your workout. Otherwise, there are pay parking spaces nearby. For parking information, please go here. Please also refer to our FAQ page for a list of answers to the questions we most frequently receive. In 2017, PARC won a City of Vancouver Award of Excellence in the Accessible City category. Accessible Media visited PARC to learn how its volunteers and participants are making Vancouver healthier and more accessible. In 2017, PARC was renamed the Yuel Family Physical Activity Research Centre. Greg Yuel and his family have been donors of the Rick Hansen Foundation (RHF) and Rick Hansen Institute (RHI) for over 20 years. Greg is also a board member of the Foundation. Their extraordinary contributions have helped advanced spinal cord injury research and improve quality of life for people with disabilities. The Yuels share RHF’s commitment to equal accessibility and inclusivity for all, and want their philanthropy to contribute to the greater good and development of the community. Greg is an avid athlete and when he saw the amazing people working out in PARC and the generosity of the volunteers, he knew immediately this was the room he wanted his recognition to be associated with. PARC is generously supported by Canada Foundation for Innovation, BC Knowledge Development Fund, Rick Hansen Foundation, UBC Kinesiology, UBC Medicine, Vancouver Coastal Health Research Institute, Spinal Cord Injury BC, and HAL Industries, and a Spinal Chord Community Research Grant. If you would like to make a donation to support PARC, click here.